Hey Mac Audio is an German car hifi manufacturer - I've installed 6.5" speakers APM FIRE 2.16 into my friends Passat and they sound really good. The quality you get for the money is unbelievable! Also installed 8" bandpass subwoofer Ice Cube 108p into a Fabia - build quality very good, nice to look at and the noise it creates - really shakes the car! So don't hesitate and get some component 6.5" - I think you will be happy with the finished result. Thanks Henry, that's really good to know as I ordered very quickly without really checking any reviews or anything! If the turn out good, might get same make for the rears. dex101 wrote: Thanks Henry, that's really good to know as I ordered very quickly without really checking any reviews or anything! If the turn out good, might get same make for the rears. I've always considered car Audio to be a little bit of a lottery. The placement of speakers can have a big effect on sound quality. A speaker which may work well in the parcel shelf side panels (because they use the boot as a speaker cavity) can be poor in the rear side panels of a Calibra. Fingers crossed that what you have works well! rips wrote: I've always considered car Audio to be a little bit of a lottery. Yeah, obviously depends on speaker placement and insulation/sound deadening of the whole area. You can buy the most expensive speakers in the world, but if you just screw it to a metal sheet, they will sound crap. They have to be installed properly. I was just trying to say, that Mac Audio have quality stuff which can be used to build a decent audio system. Well that was a long evening just to change a cam belt. Water pump looked brand new, however after fitting the new cam belt it was vibrating badly when engine was revved. Upon closer inspection the water pump was the wrong one (also explains why a "new" Cambelt looked nackered). So then had to change the water pump. So speakers all wired in an working. Pleased with how they sound considering I just ordered the first ones I found. All ready for drive down to padstow tomorrow. No real updates apart from the car is still going and loving it more and more each day. Currently have a wedding to pay for so work is minimal however currently planning ahead for next year when the car will be slowly becoming more standard. Anyone know of any bonnets or boots going, please let me know! 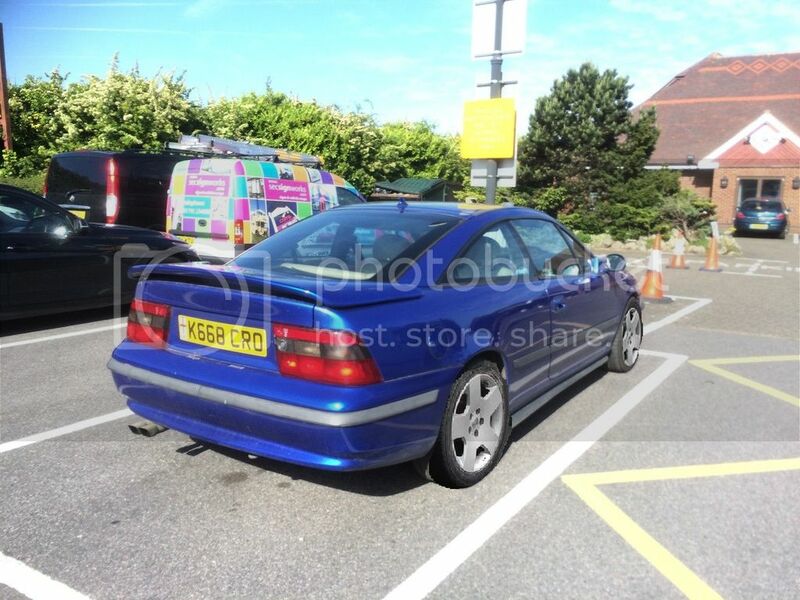 Also I am going to change the alloys, however as its 5 stud and I dont want to change it all back need to find some 5 stud vauxhall alloys that will suit. So have gone for it and bought a set of Omega Elite alloys. got them for a good price without tyres so once have ordered some new tyres will get them fitted. et39 so slightly out but seem to be just feasible. Just mocked this up really quickly in paint, think it actually looks quite good!